We have all heard about multivitamins, antioxidants, minerals and what they do for maintaining your health. 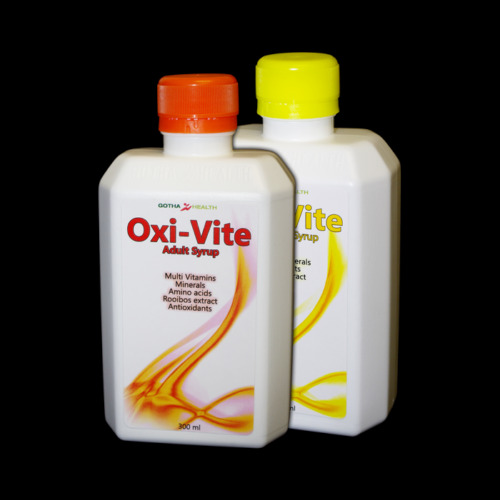 Gotha Health Products have gone a step further and formulated Oxi-Vite a combination of vitamins, minerals, antioxidants and rooibos extract all in one to give you the most advanced liquid formulation available. Taking Gotha Oxi-Vite each day is an easy way to ensure that you are getting the adequate supply of vitamins, minerals and antioxidants that you need each day. Gotha Oxi-Vite has specifically been made a liquid formulation, as liquid nutrients are absorbed faster and more effectively and as a liquid Oxi-Vite is also easy to take. Vitamin A helps form and maintain healthy teeth, bones and skin. Vitamin C promotes healthy teeth and gums. It helps the body absorb iron and maintain healthy tissue. It also promotes wound healing. Vitamin D helps the body absorb calcium, which you need for the normal development and maintenance of healthy teeth and bones. Vitamin E helps with protect tissues and fat from destructive oxidation, aids blood flow to heart. Vitamin B1 helps the body cells change carbohydrates into energy. Getting plenty of carbohydrates is very important during pregnancy and breast-feeding. It is also essential for heart function and healthy nerve cells. Vitamin B2 is important for body growth and the production of cells. Vitamin B6 helps form red blood cells and maintain brain function. Vitamin B12 helps maintain the central nervous system. Nicotinamide helps maintain healthy skin and nerves. It also has cholesterol-lowering effects. Pantothenic acid is essential for the metabolism of food and plays a role in the production of hormones. Folic acid is needed for the production of DNA, which controls tissue growth and cell function. Biotin is essential in metabolism of proteins and carbohydrates, and in the production of hormones and cholesterol. L-Arginine is necessary for the production of protein, also helps rid the body of ammonia and stimulates the release of insulin. Carnitine plays an important role in the production of cellular energy. Magnesium reduces blood cholesterol; forms hard tooth enamel and fights tooth decay; aids nerve function and bone growth; helps utilize Vitamins B, C, E; promotes absorption and metabolism of other minerals. Glycine has a variety of roles, including the potential to increase growth hormone, shuttle toxic substances such as lactic acid out of the body, and calm the brain. Rooibos extract is a unique natural product with plenty of healthy minerals and vitamins. It contains high levels of 37 known substances which act to limit the effects of superoxide molecules or oxygen free radicals. Rooibos helps to limit the many toxic effects which cause aging of the skin, muscle, internal organs and brain. Inositol is important for growth of cells in the bone marrow, eye membranes, and intestines. It helps metabolize fat and cholesterol by breaking down fats into smaller particles that are easier to remove, and reduces fatty build-up in the body organs, especially the liver and has a calming effect. Choline is involved in nerve transmission and helps move fats into the cells. Also essential for healthy kidneys and gallbladder. Gotha Health Products have made two formulations, Oxi-Vite for adults and Oxi-Vite for children as the nutrient requirements for adults and children are different.